Chrissy is incredible. I could not have asked for a better client. She was kind, generous, honest, fun, and happy. Her feedback was always on time and on point. Chrissy uses her Photoshop and watercolor talents to support the women of her church worldwide. 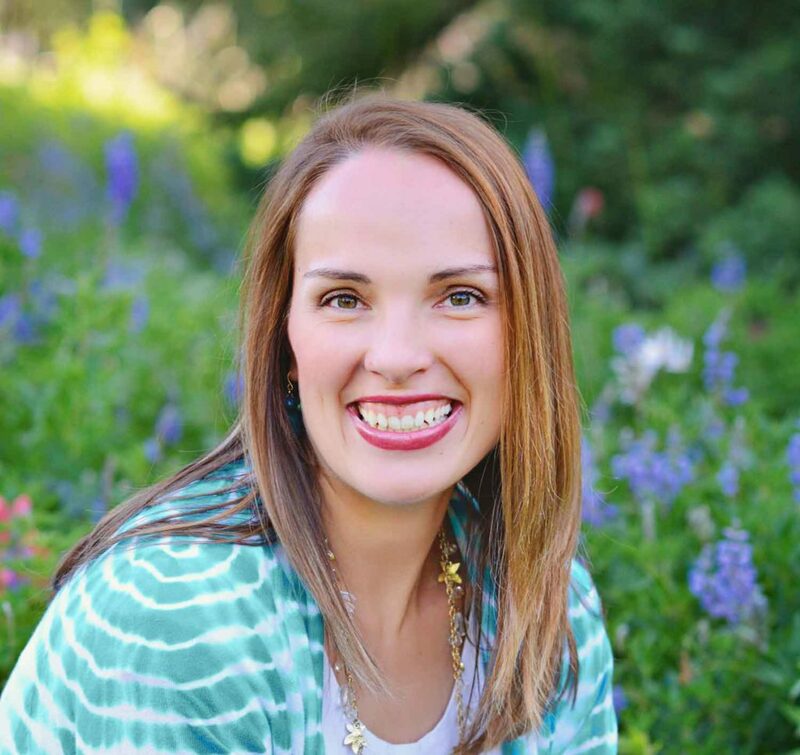 She designs beautiful printable items that women from The Church of Jesus Christ of Latter-Day Saints can use to teach of Christ in their homes and at church. But she also has a shop full of printable kits and designs that are packed with value. She always delivers more than her customers expect. As a result, her shop is providing her with income to support her family while she inspires women worldwide to teach the gospel more effectively in their homes and at church. I’d call that a win win! Chrissy, I’m going to miss our regular conversations about how we can spread your goodness to more women worldwide! 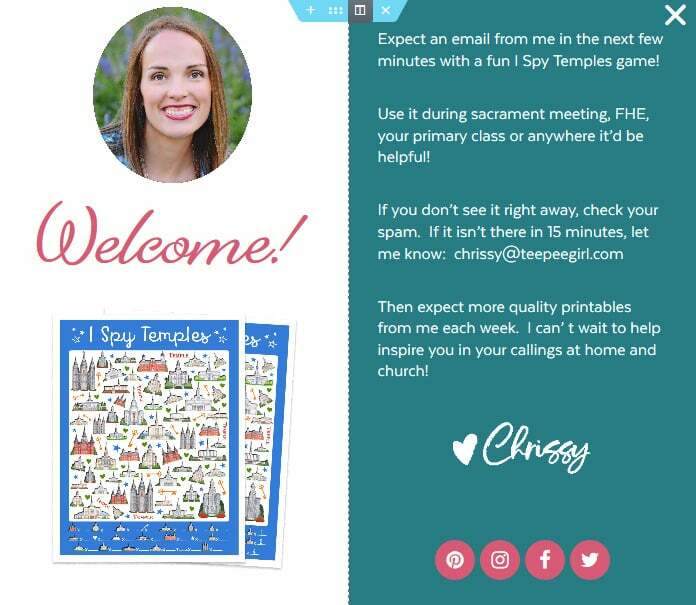 The colors and fonts of Chrissy’s original website fit her perfectly. They were bright encouraging, friendly and welcoming – which was exactly what Chrissy wanted to communicate to her visitors. She wanted control over where to send her visitors next - to lead her visitors to the pages that are appropriate for the season or a sale. I want people to feel like I care about them, no matter where they are in their faith journey. I want people to know that I care more about THEM as a person than I do about making money. Goal #1 - Focus more on her shop so she could get rid of her ads. Make it obvious that there is a shop available without making it feel like there was nothing for free. 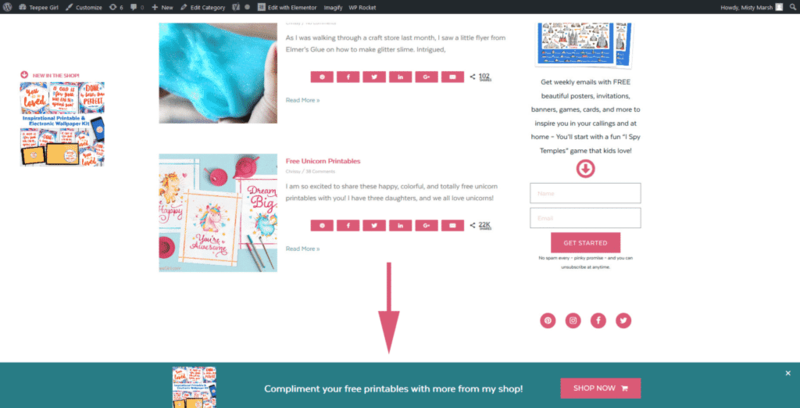 We added a floating “Shop More Pretty Printables” button to the homepage and blog page. This button follows users down the page without being too intrusive to their experience. We added a floating image that shows the most recent printable in her shop to all archive pages (any page that lists multiple posts). A click on the image or text takes you to the shop. We added an announcement bar at the bottom of all pages. It appears 3 seconds after the user navigates to their 2nd page. It only shows for people interested enough to click around as it is a bit more intrusive. Goal #2- Get more people to join her community through her email list. 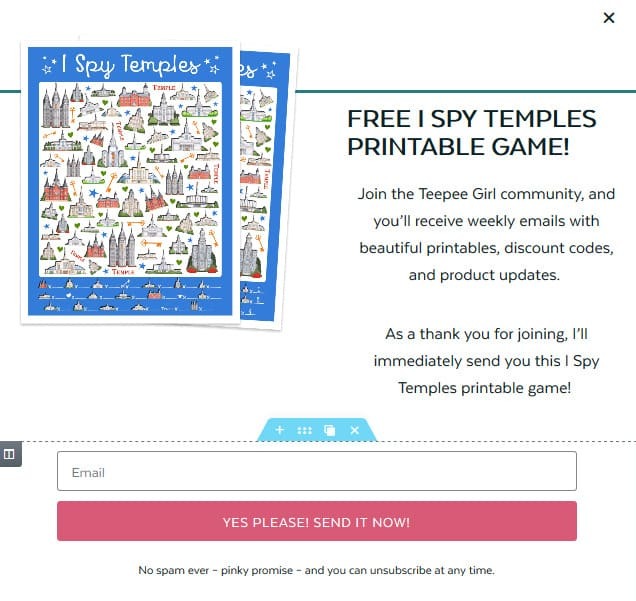 We created one popup that acts like a normal popup – it pops up over the screen. Chrissy is going to test if it works better just having it show up after 10 seconds or so OR as an exit intent popup. It will only show for each visitor once so as to not annoy repeat visitors. 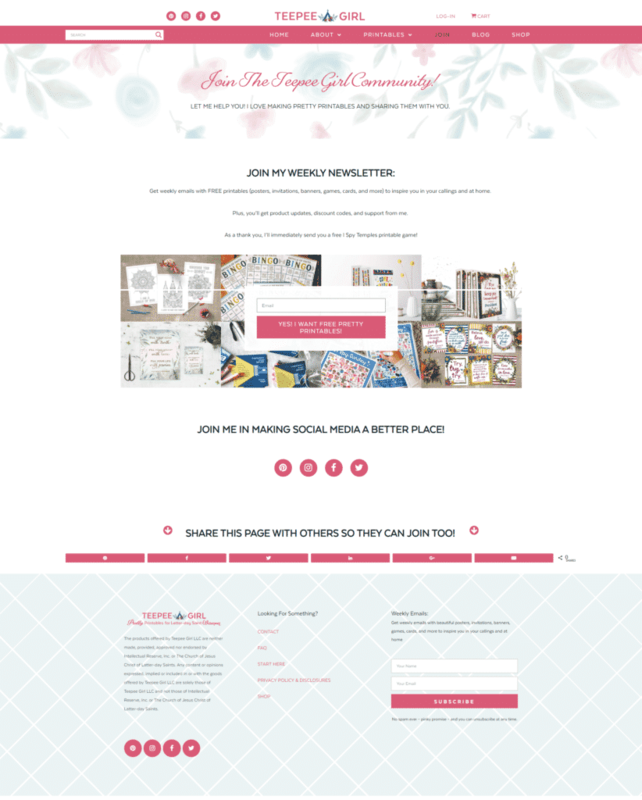 We created a landing page on her site with the sole goal of allowing people to join her community through email – and other options. We created two email sign up forms that we embedded all over her site – homepage, about page blog posts – everywhere. These aren’t annoying – they don’t popup – they are just part of the various pages we put them on. But they are always there so people can easily sign up from wherever they are on her site. Goal #3 - Give Chrissy more control over where her visitors went next. We simplified her pages. Each page now has one main goal – one step the visitor should take next. This is especially true of her homepage. It’s main goal is to encourage visitors to choose to view a category of printables. There are two main “clickable” areas on the page. The first is a section Chrissy can easily update and switch which categories they can choose from. The 2nd takes them to her well organized blog page where they can navigate to all categories on her site. 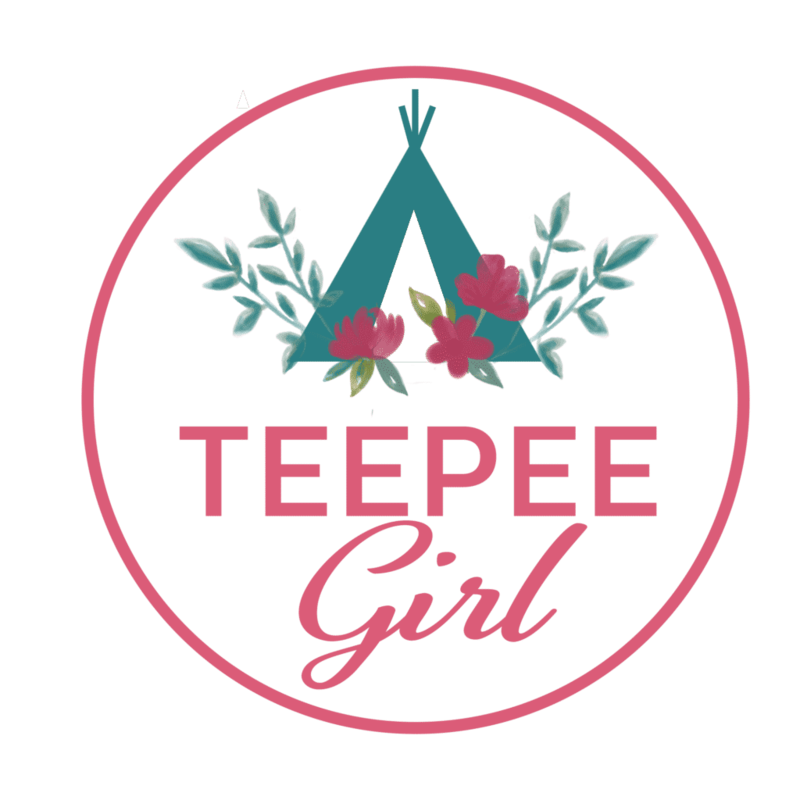 We created a section at the top of her blog page that allows her to feature any 3 posts she wants focused on for that season. She can quickly and easily change the posts highlighted here. We created a custom 404 page (complete with spilled watercolor paint) that wasn’t a dead end. Instead, it allows users to search for what they are looking for, visit a category page or go home. 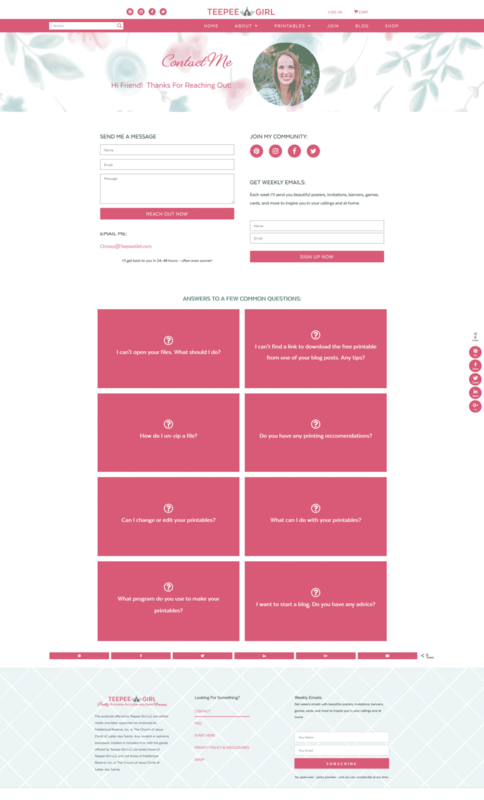 We created a blog post template with an easy to find button. The template will help because all of her new blog posts will look the same – meaning repeat visitors will know just where to look for the button. Chrissy will be updating her more popular posts to the new template. We added an FAQ page and linked to it in her footer. We also added a FAQ to her contact page. There is a question there about how to find the download link in her older posts in the FAQ. Hopefully this lessens Chrissy’s email load as well. We added Chrissy’s picture to more parts of her website instead of just her about page and sidebar. Her picture is on her contact page, her homepage and in the thank you that pops up after someone subscribes to her email list. We want her visitors to see her as a real person who cares about them – showing her friendly face more often will help accomplish this. We added Chrissy’s hand painted watercolor flowers on the top of every page and made them especially prominent on her homepage. These flowers scream Chrissy – encouraging, friendly and welcoming. We created a extensive, custom navigation on her blog page. Visitors can easily scroll to any category of printable just by clicking on the name of the category. Then, they can page through all printables available in that category – all without leaving the page. Are you looking for solutions like the ones Chrissy and I found? I would love to help you spread your own personal brand of goodness with the world!